Need a few healthy office breakfast ideas? If you're busy, you definitely don't want to skip your morning meal. Breakfast sets the course for your eating habits throughout the day. And eating right all day long is essential when you're trying to lose weight. The following resources can help you plan and prepare a healthy breakfast. You're most likely to make the best healthy breakfast at home. But what if you just don't find the time to eat at home before you leave for work? Forget high-calorie breakfast sandwiches at the drive-through. It's easier than you think to have a healthy breakfast at the office with these ideas. High protein (low-calorie) snack bar. You'll notice that these breakfast ideas are foods that contain whole grains, protein, and fiber—all nutrients that provide energy for a hard day's work. They also help you to feel full longer so that you're not tempted to snack in the mid-morning. If there is food at an early morning meeting and you left home without eating breakfast, it's virtually impossible to resist a treat. 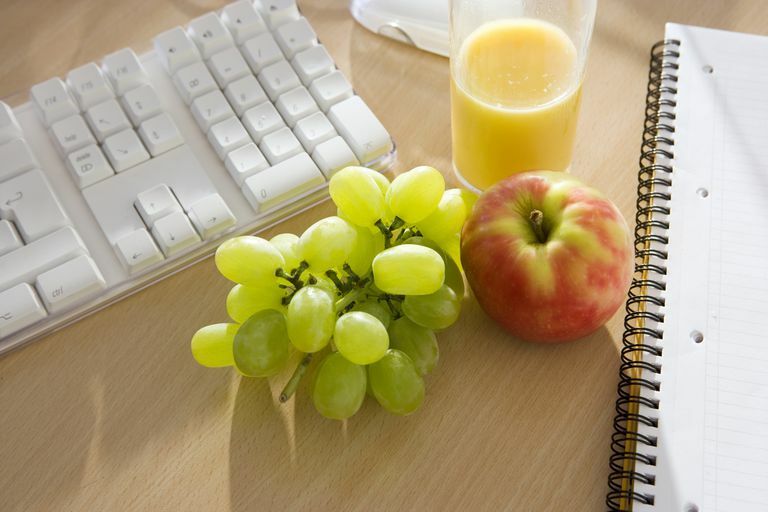 If you don't have any healthy office breakfast supplies on hand, there are a few tricks you can use to keep your healthy eating plan on track. First, keep an eye on portion sizes. If you choose to indulge in an office treat, eat a small single serving and then walk away. And don't be sucked in by sugar. Remember, typical office foods, like cookies, pastries, and doughnuts give you a temporary energy rush. But then you crash later. Be mindful of the difference between eating because you're hungry and eating because there's food available. Know the difference. If you're not truly hungry, don't eat. Avoid the food altogether. If you feel your resolve is waning, try to sit away from, or with your back to, the snacks. It's important to have a backup plan for situations when you just can't seem to get it together in the morning. If you don't have a chance to get any food, but you can't do without your morning coffee, make sure you choose the lowest calorie coffee drink at Starbucks or your favorite shop. For example, a tall nonfat latte has just 100 calories and 10 grams of protein and will stave off hunger for a while. Can Breakfast Mistakes Sabotage Your Diet? Should You Reduce Carbs Gradually or All at Once on a Low-Carb Diet?